The one of the most awaited flick Tanu weds Manu returns is a sequel of Tanu Weds Manu in 2011.It was a decent hit then and now its time for Tanu weds Manu 2. Anand L.Rai Directed this flick in which actress Kangana Ranaut and actor Madhavan are lead pair. where the story rotates around them. Krsna Solo was the music and Bgm department of the film Tanu Weds Manu Returns. So, guyzz stay tuned to this place for Tanu Weds Manu Returns-2 Reviews and Ratings. attractive and made every seen an upto mark humor. Raviteja-Rakul Preet Singh Kick 2 telugu movie reviews and ratings..
Kamal Hassan - Ramesh Aravind Uttama Villain telugu movie was the most awaited movie for all the telugu film lovers and all the Kamal Hassan Fans. So guyzz here is the Review for all.. Uttama villain is slow drama .. where there will be a film in the film... As the actor was kamal hassan the movie goes on very cool.. We need 100% patience to watch the film. And after completion of the film we will fill like water from the eyes.. Kamal once again touches the heart of audience with his fabulous acting...SO we cant give a stamp rating as this film has to be feel with heart,it depends on every individual..
After huge success of Legend by Boyapati .. Now Nandamuri Balakrishna is roaring as NBK lion with Trisha and Radhika Apte as lead pair with him.. Manisharma scored excellent music for the film and made fans enjoy the beats. Now the time arrived to see NBK lion on big screen And he hits the screen today,, The movie gets complete positive response .. And the NBK lion movie review and rating is as follows. After 18 months in coma Bose (Bala krishna ) came out and see the outside world. But the people around him calls him as Godse.. But Bose didnt agree to it and try to convince them as he was not Godse , he was Bose. So, here the story stars who was Godes and Bose , how they related to each other and where are Trisha and Radhika Apte..
Balakrishna action in a Story based movie makes the scenes upto the mark.. If one love Balayya Lakshmi Narasimha then they will like this too..
Hello Tarak fans,,,Waiting for Rabhasa movie and songs..just wait.. i have got some bad and more good news for you..Yes,while coming to bad news was..Our NTR Rabasha audio release was postponed form July 20 to July 27..As on 20th there were Bonalu in our Hyerabad.,So police didnt gave green signal for audo function because of security issues..So they gave permision on 27th..And the good news comes here ,that producer Bellamkonda Suresh planned A big blast of Rabhasa Audio release on 27th. Yes in the function music diretor Thamman along with his artists was going to perform all the songs live on stage..As per the news Thamman provided an extrodinary muic for NTR Rabhasa...Even there were high estimation on both movie and music as,Tammanh scored excellent audio for NTR in his films and NTR, Samantha Third combination for the movie where Pranitha was special attraction for the film. So friends we have to wait to see Full Rabasha On big Screen till August14..
HI freinds.,,I think all of you watched " Drishyam ".If not go and watch it now.Yes,once again our Victory venkatesh did an excelleent work with that film.And after huge success of that film,he now going to do one more different kind of film which is of a "Mime" movie that was no sound.Yes,this was going to be directed by pilla Jamindhar fame Ashok. Venky was very much impressed by he script line said by him.So he immediately gave green signal to the film.Now the director was busy with the script work.Where the story was inspired from Kamal Hassan "Pushpaka Vimanam". 3dtollynews wishes Victory Venky a very huge success ..
Friends now a days lip lock scenes are common in our films..,Even they are the extra attraction for the film..But our glamorous actress Sruthi Hassan and Gorgeous Tamanna had a lip lock with each other..Yes,but this was not in reel life it was in real life..According to the sources When they met each other in a function, suddenly they hugged and have a lip lock kiss,forgetting the crowd in the function they both discussed about their career options.We also know that sruthi hassan was going to perform an item number in Mahesh and Tammannah Agadu. Our Milky beauty also said that shruthi hassan is very good , hot and also she liked her nature too. 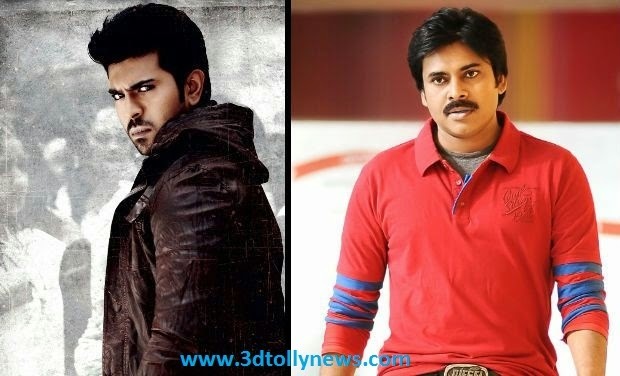 Power star and Cherry are in same path of Awards...? Power Star and Mega Power star are in the same path..yes recently power star "Atharintiki Daredi" bagged four awards, but Pawan Kalyan is not in the list of these awards.This seems like Mega Power Star Ram Charan's missing of Nandi Award for "Magadheera". Yes "Magadheera" received many Nandi awards and strangely Cherry could not get best actor award. According to some gossips,a groups of people played the roles of "Sikhandi" to make Ram Charan missing the award. Of course,Cherry got best actor awards for his performance from all other award agencies including "Filmfare".We have to see whether Powerstar gets best actor award for his performance form other award agencies including Nandi. we all know that Our director Jakkana (Rajamouli) , Baahubali was made with Rs.175 crores,and starring Prabhas,Rana,Anushka were the lead roles.We are watching how hard they are working for the film..
And even the film was not completed,but Rajamouli planned for another movie which will be more budget that Baahubali i.e.Rs.175 crores. TO achive this task, he decided to do "Mahabharath" in hollywood. According to the sources,Jet Li from hollywood and Ranbir Kapoor from bollywood are roped by him. Lets wait and see what it will be. Until the news comes out, we have to wait and see for the release of Baahubali. Keeravani scores the music ,Shobhu Yarlagadda and Prasad Devineni are producing this movie Arka Media Works.